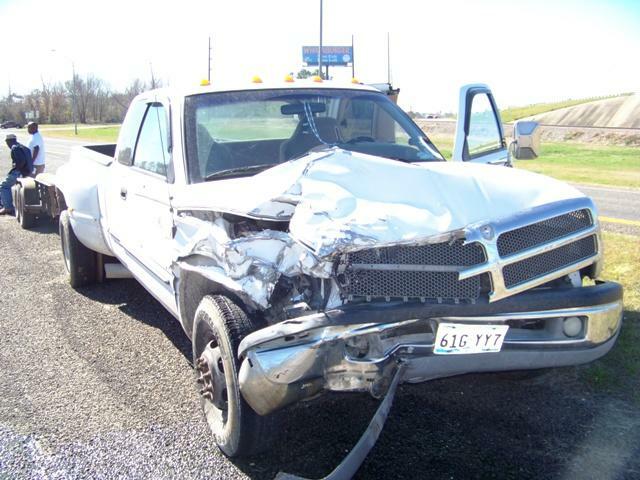 Kaye's vehicle was broadsided and spun around. Lunchtime Accident on Business 59 at Highway 146, LIVINGSTON, January 22, 2009 - Shortly before 12:30 pm on January 22, 2009, a silver 2007 Toyota Tundra driven by Jody Kaye, 60, of Cleveland, was east-bound on Highway 146 and attempted to cross over Business 59. 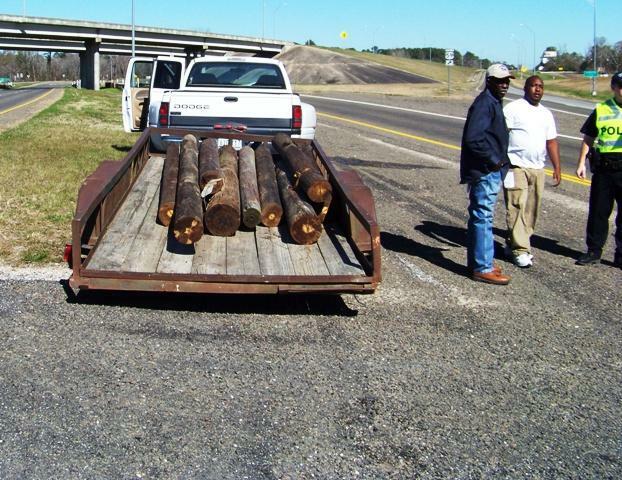 Kaye failed to yield right-of-way to a white 2000 Dodge duly that was pulling a trailer loaded with wooden poles, north-bound on Business 59 and driven by Lacy Walker, 28, of Diboll. 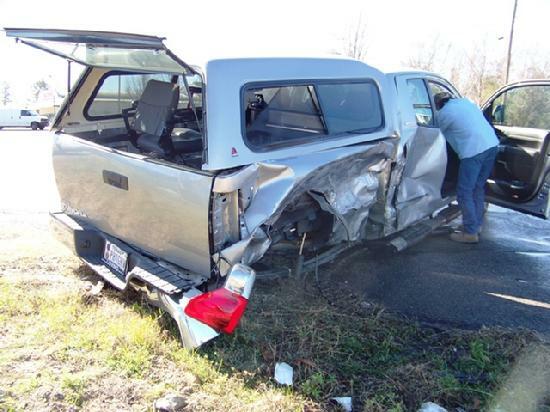 Walker's truck broad-sided the rear half of Kaye's vehicle spinning it around and knocking it to the east side of Business 59 while Walker's vehicle came to a stop a short distance further in the median. Livingston Police Officers Lewis Milner and Rob Atkins and DPS Trooper Sam Lattner were dispatched to the scene. 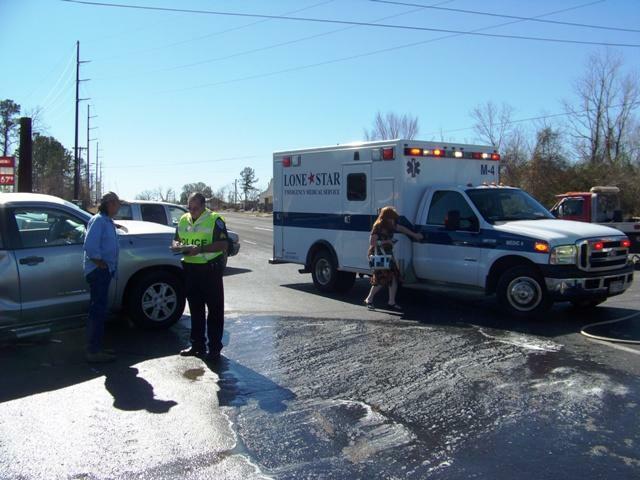 Kaye had a passenger (Gordy Robinette, 87, of Livingston) who was transported to Livingston Memorial Hospital by Lone Star Ambulance Service; all other parties involved were physically okay. 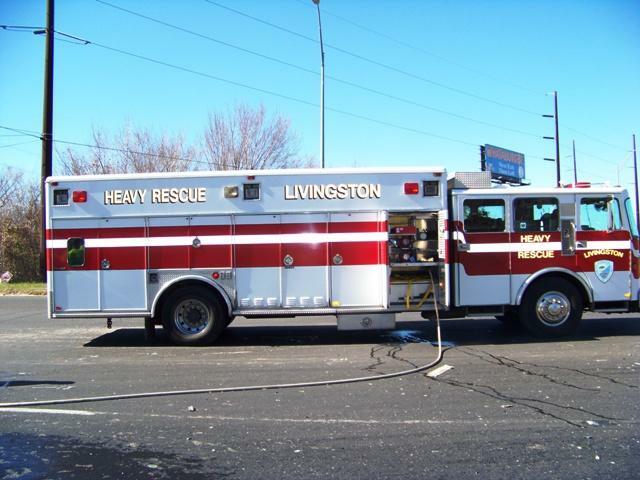 A fire engine from Livingston Volunteer Fire Department arrived to hose off the road from vehicle fluids. 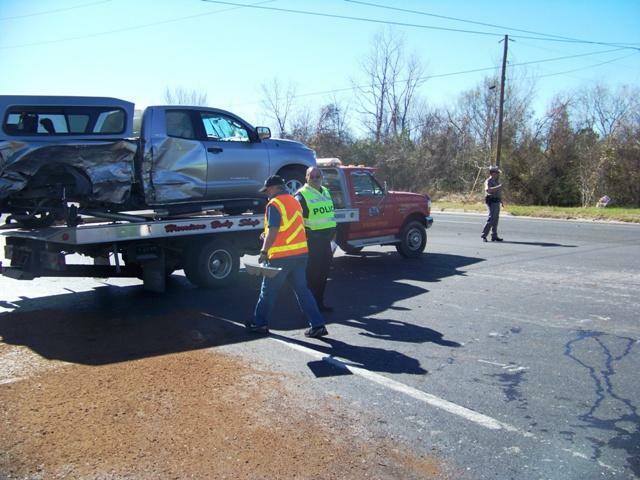 Both north-bound lanes of Business 59 were blocked as the accident was being investigated and cleared. Both parties had insurance. A rollback wrecker from Ken's towing removed both vehicles from the scene and they'll be stored at Harrison's Body Shop in Downtown Livingston. The scene was cleared and traffic fully flowing shortly before 1 pm. Walker's vehicle sustained heavy front end damage.